Not true: Millard Fillmore did not install the first bathtub in the White House. A piece authored by HL Mencken was published in the New York Evening Mail on December 28, 1917 — 33 years after Fillmore died! — that credited Fillmore with the plumbing innovation. It was all a hoax, though … but it was a hoax that came to be cited as fact for decades after the piece was published. Mencken eventually admitted that the article was not true, but not before Millard Fillmore had his reputation besmirched. Poor guy; his reputation wasn’t that good to start with! True: Millard Fillmore was born in a log cabin, and grew up very poor on the New York frontier, in the Finger Lakes region. He was apprenticed to a cloth maker at age 15, where he learned to card wool. He was a compromise candidate when he became the Vice Presidential nominee for Zachary Taylor. Texas surrendered its claim to New Mexico. The slave trade in Washington DC was banned (though slavery was not). New Mexico and Utah were named US territories with no clear ruling about slavery within their borders. The Fugitive Slave Act required Federal law officers to return runaway slaves to their owners. 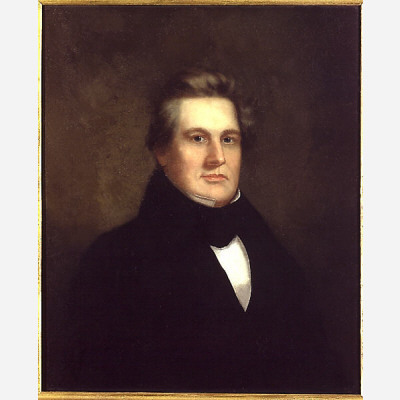 Fillmore directed Commodore Perry to travel to Japan and open that nation to trade with the west. 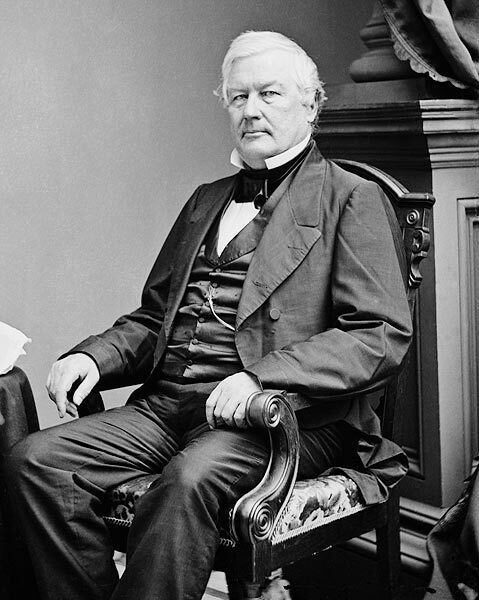 Fillmore directed Perry to use the guns on his steamships to persuade Japanese representatives if they refused to allow Perry to present Fillmore’s letter to the Emperor. The threat was not necessary, and trade with Japan became a reality. 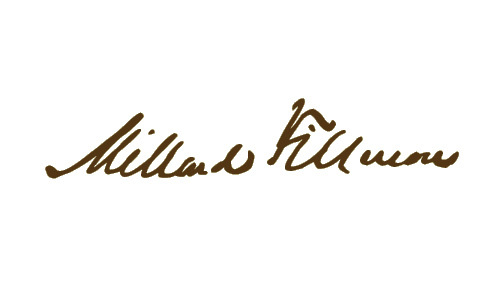 Fillmore threatened to use the US Military on three occasions to help enforce domestic law: against Texas, when that state’s militia was about to invade the territory of New Mexico; against South Carolina, when that state was rumored to be near secession; and against a citizen revolt that attempted to lead a coup against Cuba … and failed. The Whig party would not nominate him as their candidate in 1854. He eventually became a third party candidate representing the racist “Know Nothing” American Party … which he joined perhaps not because of their ideology, but because it was the best political platform available to him at the time. He lost, winning only the state of Maryland, and retired from politics. He was not a weak President, but is often seen as such, since his actions failed to save the Union and prevent the Civil War. Today, his legacy is as much about what isn’t true as it is what he actually accomplished. 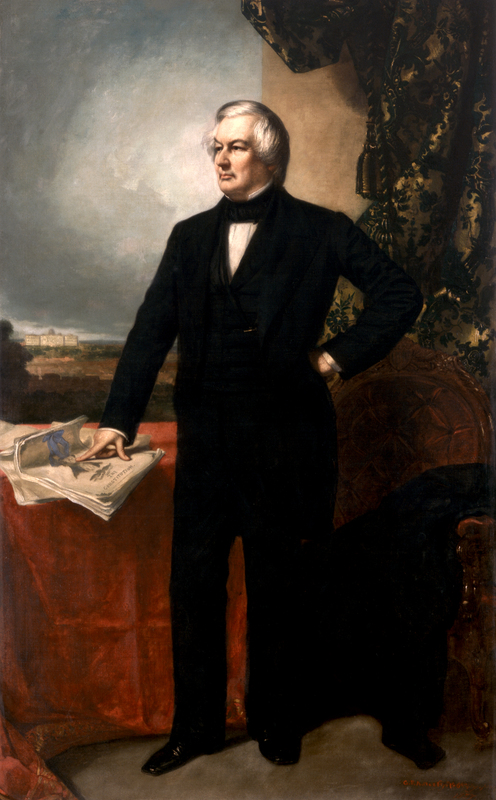 The Official Portrait: Congress commissioned George P. A. Healy to paint six Presidential portraits: John Quincy Adams, Martin Van Buren, John Tyler, James K Polk, Franklin Pierce and Millard Fillmore. Fillmore was finished in 1857; the rest were all complete by 1859. At that point, the paintings were then stored in the White House attic, as framing had not been budgeted. It was left to Andrew Johnson to frame and suitably display the paintings after the Civil War. But the question remains, who did have the first bathtub installed at the White House? The first bathtub was installed for John Adams, the first president to live in the White House. There were baths prior to 1850. A slightly more technical question is, who had the first bathtub installed with plumbing, the first plumbed bathtub. Improvements made at the White House in 1833 — in the administration of Martin van Buren — included a “bathing room” in the East Wing, “downstairs” from the living quarters. This was the first plumbed bathtub. There were two, a “cold bath,” and one with water that could be heated by boilers. Pierce put in the first plumbed bathtub in the presidential living quarters upstairs, in 1853. Those dates come from architectural historian William Seale.